Ultima II: Revenge of the Enchantress is the second installment in the Ultima series. It was released on August 24 1982 and published by Sierra Online for the Apple II, IBM-PC and Atari 8-bit. They were the only company that agreed to Richard Garriott's conditions. Later conversions for the C64, Atari ST and Macintosh followed. Graphics and gameplay changed only little from Ultima I, making the game basically the same. The second installment of the series is also the strangest. The game deals with several different time periods on Earth, has numerous pop-culture references, science-fiction elements, and travel throughout the Terran Solar System. The game as released is also quite buggy, and has many areas that are simply empty (some of the planets of the solar system have literally nothing on them!). This total flipped-out mix of themes seems really odd today, but wasn't that strange in the early 80's. Still, today many consider it the weakest installment of the series. 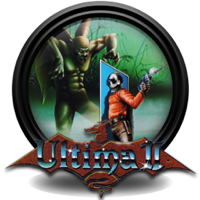 Despite all its flaws, Ultima II was quite a success in 1982, sold well and made enough money that Richard Garriott could found his own company, Origin Systems, which in the future was the publisher for all the Ultima games developed. Of course, the venture with Sierra had some unwanted results as well. The Player, again as the Stranger, doesn't have the task to save Sosaria, but instead Earth itself from the Enchantress Minax. Being the lover and apprentice of Mondain, she is quite angry over his death by the Stranger's hand, and swears revenge. Manipulating the timeline to this end, she let Earth die in an atomic holocaust in 2111 - all life on Earth perished in the Aftermath. The Stranger, having escaped from the changes in the timeline at the last moment, has to decypher the mystery of the Time Doors, which enable time travel, to reach Minax and prevent these horrible events from ever happening. Gathering the only weapon that can kill Minax, the Quicksword Enilno, and wearing the protection of the Force Field Ring, the Stranger travels back to the Time of Legends and confronts Minax in her castle to kill her. With her death, the timeline returns to normal, with no one remembering the horrible events that occurred in the changed timeline - all except the Stranger. ▪ Sierra On-Line, located in California, was chosen to publish Ultima II because they were the only company willing to spend the money needed to include the cloth map with every game Richard Garriott insisted on. ▪ After a number of difficulties dealing with Sierra, the Garriott family founded Origin Systems in their home state of Texas. Afterwards, their former publisher refused to sell the rights back to Origin for many years, and never relinquished the original cover artwork. 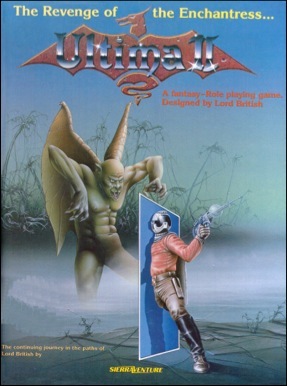 ▪ Because Origin never acquired the rights to the original Ultima II cover art, a stand-in was used for subsequent anthology re-releases of the game, such as in the aforementioned Ultima Trilogy. The stand-in is a cropped version of the original cover for Akalabeth. Minax's castle in the Time of Legends as well. ▪ When the game begins, Lord British will heal you 300 HP for each 50 GP you give him. Later on, after you've become stronger, it drops to 100 HP per contribution. This is done so as to decrease the likelihood of "rolling over" the HP counter, which will instantly kill your character if it happens. ▪ It is little known that the front and backside of the original box are one big picture, and the effect got lost in the new editions. The advertisement seen on the right shows the art in its whole glory. ▪ One of the first games (apart from text adventures) ported to the Atari ST.
▪ First original release of a Ultima game on more than one system. ▪ The last Ultima NOT published by Origin, unless one counts Escape from Mt. Drash.